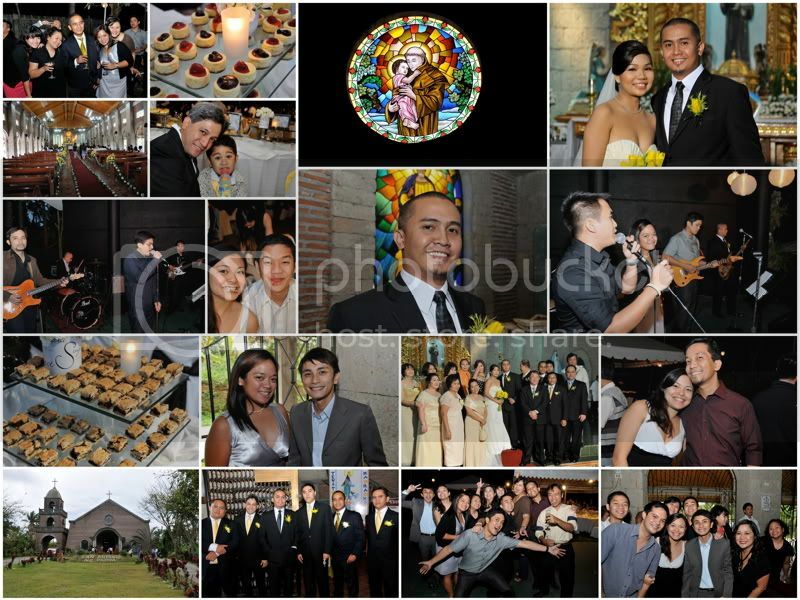 over the weekend, i attended my friend joven's wedding at the san antonio de padua in silang, cavite. it was a chilly, windy afternoon in the company of people with whom i've cultivated deep friendships at high altitudes. joven himself i count as among one of my dearest mountaineer friends, on whose strength of character and strength of will i have relied on so many times in the past. i have shared not just tent space with joven, but many other things that we still laugh and cry about, but some of them suddenly sordid now that he's married (technically, he's been married since after the civil ceremony celebrated early last year, and this church wedding was only a very filipino affirmation of something already done). of course, i've known about sammer, his wife, from the very beginning. although there was a time when kuya mar and i invented this story that sammer may be imaginary, since 3 times we dropped by häagen-dazs in glorietta where she used to work and always failed to find her. i could go on an on about my adventures with joven, both up in the mountains and down in the plains: when i forged alongside him up and down steep and foggy trails or when i helped him each time he showed narcoleptic tendencies when alcohol had gotten the better of him. such is the nature of our friendship: that after nearly 5 years of knowing even his smallest faults, i still regard him for his stellar qualities. and it is because of that deep bond that i traded paid tickets to kalibo in order to be present when he says "i do". getting to the venue of joven and sammer's wedding was in itself something of a small feat. i convoyed with common friends from makati to cavite, and went around to tagaytay to reach san antonio de padua in silang, which seems to sit along a wind channel. the wedding ceremony was brief. sammer sparkled in her gown, and joven looked cool and composed -- nah, he was terrified. i know the man too well! and i've known many men who are consumed by so much stress on their wedding day. one former professor from law told our class that he would rather take the bar exams all over again, than get married in church for a second time. and since the bar exams have so far been my most terrifying experience, i can only imagine how much more excruciating getting married would be. after the ceremony, we drove back to aguinaldo highway for the reception at gourmet's. there was no grand wedding cake. instead, there was a dessert buffet featuring all of sammer's creations: revel bars, brownies, little cheesecakes, chocolate beehives, pastry swans, and little sinful dollops of sugar and calories inside miniature glasses. it was divine! sammer and joven shared a ceremonial slice and invited all the guests to "indulge". and that is exactly what we did. so although there was a shortage of alcohol (given our steep thresholds), the sugar high was a potent shot of energy that kept us dancing the whole night. prior to the wedding and during the reception, i barely had enough time to speak to joven, who was busy entertaining family and friends. we exchanged probably less than 30 words in total, and most of them were variations of "congratulations" and "thanks". i will confess that i felt a tinge of jealousy: was i losing a friend to marriage? i've gotten used to seeing him in the almost weekly drinking sessions that was allowed by our bachelorhood, and not having him around would make things incomplete. i may not be prepared for the sudden change in my "routines". but enough of these selfish thoughts. to joven and sammer, may you both find the recipe to a beautiful lifetime together built on a mountain of love. cheers!